Some folks say that if you don't know a country's nightlife you don't know that country at all. Wakakozake can work as an amazing "guide" for us westerns who know little to none about japanese true night life related with the japanese regular Joe who, as many of us, enjoys a nice drink with some comfort food after a tough day of work. I want to make and eat everything! For the 26 year old office lady in all of us, Wakako emphasizes with our plight and shows us her way to melt away your troubles. Commiserate as she describes what occupies her mind. Taste the sensations she's seeking with each bite and drink. And as she reaches dining bliss, you will feel a tug that will pull you to try this for yourself. Did I just find an anime about a female me? Brilliant job done for such a small time slot. It's simple, light and adorable. At two minutes per episode it is more than worth watching. At first the art style really threw me off and made me hesitant but it adds an adorable charm that completely fits the series. This short anime gives us a look into the life of Murasaki Wakako, who enjoys going out to restaurants after work to sample different food and drink combinations. Each episode is packed with the events of Wakako's day, her solitary inner monologues, as well as her feelings about the featured dish. Wakako is a true foodie and spares no detail in describing how each piece of the dish adds to the overall effect of the food. If you're looking for awesome (and very SFW) food-gasms with a laid back attitude, then this is the show for you. Who doesn't like to escape the workday with a quiet drink? Add a bit of food and you've got more than a late meal, you've got affirmation! Personally, I love nothing more than a cold beer and a burger basket at my favorite bar, but still frequently try new places. I just love food. So I'm in the same boat as Murasaki as she visits stall after stall, seeking to gratify her taste buds. A cute, quick anime about a fun and pleasant pastime. The animation is only 2 mins each and go through a Japanese post-work drink & snack combo. It's essentially what I love to do whenever I can after work! The laid back characterization and depiction of work events are pretty classic and easily relate-able. Edit: for those who haven't already - check out the live action. It's 2 seasons worth of introduction to Tokyo eats!!! Ahh, what shall we drink tonight? Wakakozake is a super short, super relaxing new title hitting Crunchyroll this August. Apparently, the network thinks so highly of the new show, that right off the bat, the first seven episodes aired with moderate fanfare, and it's easy to see why. Murasaki Wakako is an oddly drawn 26 year old OL. (Office Lady) While other people around her are drawn in typical anime fashion, her head looks like a first grader drew it. She works a regular 9-5 job, and likes to unwind by visiting different restaurants and trying out the dish of the day, along with a side of beer, sake, wine or whatever the house is offering. As she waits for her dish, she often goes through the memories of her day at work, or she'll think of the surroundings and ponder over the other people at the bar. Once the dish arrives, she describes in great detail what the food tastes like. She'll muse about each ingredient separately, and then tell you how it should be best served. If she likes the meal, she'll sigh out a long, silly "PSHUUUUUUUUU" before dreamily letting the episode end. For just being two minutes long, this new show is educational, funny, clever and most of all, relaxing. It's the right show to watch before bed, and it's the perfect way to introduce Japanese cuisine to American audiences. As a thirty-something, I start to feel a little uncomfortable about my love of anime as a medium, as so many shows continue to be about teenagers. 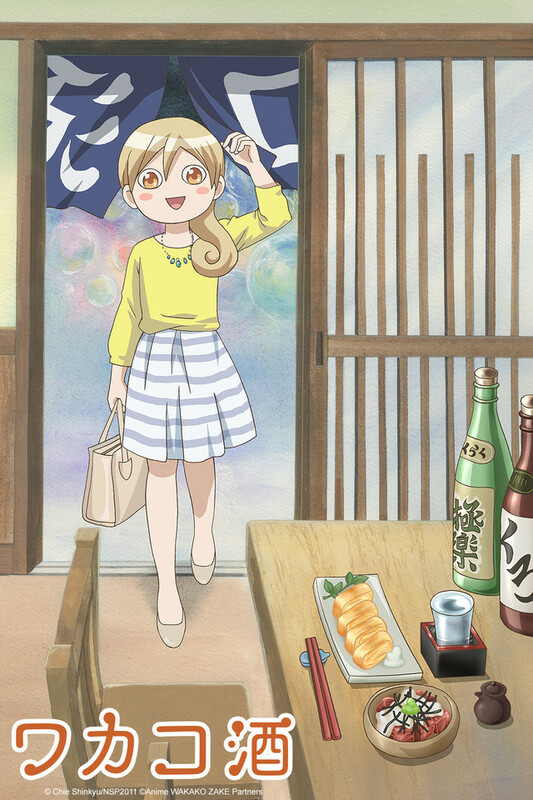 Wakakozake is a refreshing departure from the norm, following a working adult as she deeply enjoys being a foodie. The ...bite-size episodes are refreshing and delightful to enjoy. Two minutes of gorgeously-designed description of the pleasures of food and drink. Through that, we slowly learn about the personality and character of Murasaki Wakaso. I'm no expert, but I believe I've ever encountered an anime about a young single woman just going through her life quite like this. And each episode makes me hungry. I think we may have to start eating Japanese food on Sunday nights in our house.